Art can be ordered via the "want list" option on the website or direct e-mail or phone (917-821-8893 if necessary). E-mail works best for me as I am in and out at home. If you order by direct Email please put "ORDER" in the subject heading. Please describe the page(s) that you are interested in by artist name ,title and page numbered price . Also let me know how you prefer to pay. I will then confirm with you that the art is available. Art will ship when payment is made . If paying by Money order I insist on United States Postal Money Orders from the post office, so please if you have to go anywhere to get a money order go to the US POST Office. Any other money order is just like a check that has to clear . I tend to get orders out every other day So please allow time (1-2 days ) for your order to ship . It's going out the same day or next day payment is received. "Time Payments" can can be arranged. Let me know what you are interested in and how long you need to pay. Down payments are a commitment to finish the deal. All money received on payments can only be used for "store credit ". No cash refunds on deposits. DON'T just put "art order" or nothing, it really helps me A LOT to put the art that you are actually ordering in the description that way I can print it out from the Paypal website for your packing slip . AGAIN PLEASE PLEASE PLEASE PUT ORDER INFO IN THE PAYPAL PAYMENT !!!!!!!!!!!!!!!!!!!!!!!!!!!!!!!!!!!!!!!!!!!!!!!!!!!!!!!!!!!! Also if you have a different shipping address than your confirmed paypal put that in your paypal invoice . 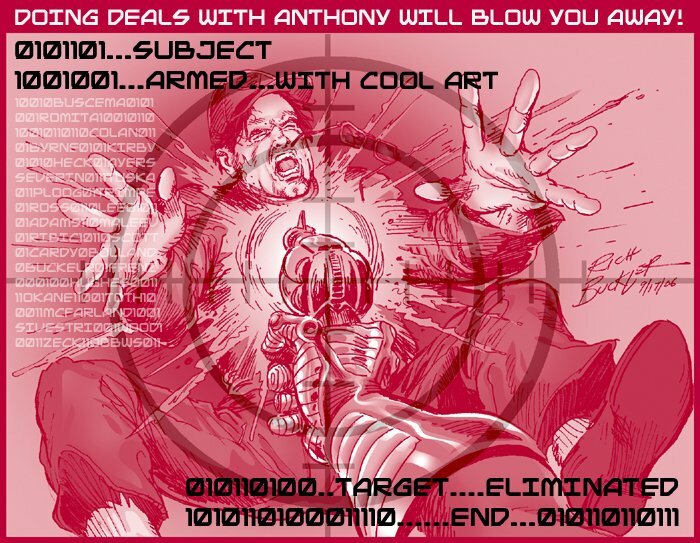 Remember to add anthony@anthonysnyder.com to your inbox so our emails don't end up in your spam ! I HAVE BEEN GETTING BLOCKED BY YAHOO AND COMCAST IF YOU ARE NOT HEARING BACK FROM ME CALL 917 821 8893 ABOUT YOUR ORDER I ALWAYS RETURN ALL EMAILS !!! Mailing payments , trade or selling art to : Anthony Snyder 325 Allaire Avenue Leonia, NJ 07605 Minimum shipping and handling charges on all orders OVER $100 within the continental US with "DELIVERY CONFIRMATION " via USPS is $10.00 (Postal rates have just gone up again AS OF 1/1/10!). Economy shipping choice for items and/or orders under $100 USPO priority mail w/ delivery confirmation $6.50 no signature required. SPECIAL NOTE TO INTERNATIONAL BUYERS! If you do not ask & pay for express mail service with tracking info, packages will be sent GLOBAL PRIORITY FROM THE U.S. POST OFFICE with no insurance & LITTLE declared value for customs. Buyer assumes 100% risk on delivery. I have a 100% track record though, no package has been lost yet.